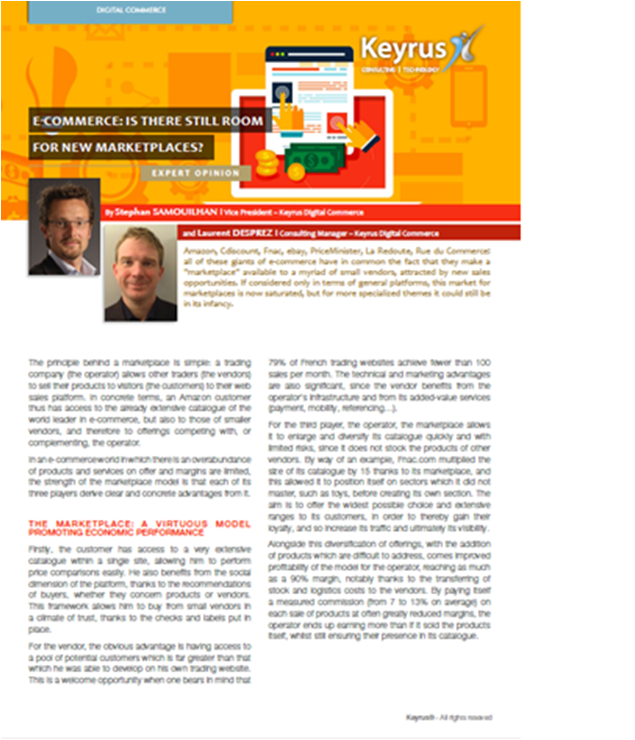 KEYRUS | E-commerce : is there still room for new marketplaces ? E-commerce : is there still room for new marketplaces ? Amazon, Cdiscount, Fnac, ebay, PriceMinister, La Redoute, Rue du Commerce : all of these giants of e-commerce have in common the fact that they make a "marketplace" available to a myriad of small vendors, attracted by new sales opportunities. If considered only in terms of general platforms, this market for marketplaces is now saturated, but for more specialized themes it could still be in its infancy. The principle behind a marketplace is simple : a trading company (the operator) allows other traders (the vendors) to sell their products to visitors (the customers) to their web sales platform. In concrete terms, an Amazon customer thus has access to the already extensive catalogue of the world leader in e-commerce, but also to those of smaller vendors, and therefore to offerings competing with, or complementing, the operator. In an e-commerce world in which there is an overabundance of products and services on offer and margins are limited, the strength of the marketplace model is that each of its three players derive clear and concrete advantages from it. Firstly, the customer has access to a very extensive catalogue within a single site, allowing him to perform price comparisons easily. He also benefits from the social dimension of the platform, thanks to the recommendations of buyers, whether they concern products or vendors. This framework allows him to buy from small vendors in a climate of trust, thanks to the checks and labels put in place. For the vendor, the obvious advantage is having access to a pool of potential customers which is far greater than that which he was able to develop on his own trading website. This is a welcome opportunity when one bears in mind that 79% of French trading websites achieve fewer than 100 sales per month. The technical and marketing advantages are also significant, since the vendor benefits from the operator's infrastructure and from its added-value services (payment, mobility, referencing...). For the third player, the operator, the marketplace allows it to enlarge and diversify its catalogue quickly and with limited risks, since it does not stock the products of other vendors. By way of an example, Fnac.com multiplied the size of its catalogue by 15 thanks to its marketplace, and this allowed it to position itself on sectors which it did not master, such as toys, before creating its own section. The aim is to offer the widest possible choice and extensive ranges to its customers, in order to thereby gain their loyalty, and so increase its traffic and ultimately its visibility. Alongside this diversification of offerings, with the addition of products which are difficult to address, comes improved profitability of the model for the operator, reaching as much as a 90% margin, notably thanks to the transferring of stock and logistics costs to the vendors. By paying itself a measured commission (from 7 to 13% on average) on each sale of products at often greatly reduced margins, the operator ends up earning more than if it sold the products itself, whilst still ensuring their presence in its catalogue. Welcoming vendors which often compete with their own offerings has ended up being a source of additional revenues for the operators, and if 7 of the 10 largest e-commerce players in France have launched their marketplace these last 10 years, this is not by accident. In the wake of the forerunner Amazon in 2003, the others followed, like Rue du Commerce which went from nothing to more than €100million in revenues between 2007 and 2012. These are bright prospects which should allow the marketplace market to grow by 36% between now and 2016, to a point where it will account for 18% of French e-commerce. Nonetheless, the main generalist marketplaces are more often than not backed by longstanding key players in e-commerce or in physical sales, mass consumer portals with vast catalogues of offerings, whether they be in BtoC (PriceMinister, Cdiscount...) or even CtoC (Ebay, airbnb...). Faced with these heavyweights of e-commerce, there appears to be limited scope today for setting up a new marketplace with a generalist positioning. On the other hand, another avenue offers great potential : vertical, themed marketplaces could indeed have a bright future ahead of them, by meeting a real need on the part of consumers or BtoB buyers. In this way, several brands have positioned themselves on this segment in recent years, whether they be traditional Bricks & Mortar players like Nature & Découvertes or Pure Players like godsavethekids (children's products), medicanimal (animal health) or Rasoir Online (shaving specialist). There is no shortage of examples and the key to their successful development generally involves their ability to rally around them the entirety of a sectoral branch, with a very broad catalogue of products or services, aimed at a more limited audience, but a very targeted one. By opening its marketplace in 2010, the GreenRepublic site (acquired in 2014 by its competitor GreenWeez) thus went from 9,000 references of organic products to more than 24,000 in less than a year, by recruiting intensively more than a hundred small traders, with catalogues limited to fewer than 10 references. By reinforcing checks on vendors in order to offer a differentiated customer experience and added services, these marketplaces can manage to generate revenues equivalent to the generalist marketplaces. The Etsy website, specialized in handmade and vintage products, thus succeeded in achieving revenues of $1billion after 6 years. Opening a marketplace is thus entirely feasible today, provided you are assisted by a specialist, to put in place a technical structure calling upon multiple areas of know-how, but above all to ensure its successful positioning on the market and to know how to approach this new business activity, which is different from traditional e-commerce. Indeed, the project's success will depend above all on the standards of quality imposed by the operator, then on the recruitment of reliable vendors and on the means implemented to make them sell in greater quantities and more effectively.